This was the third time I circled the perimeter of the College of New Jersey looking for the visitor parking lot. Most of the parking lots were an expanse of ice and snow on February 19th. I gave up and asked the campus police where was a safe place I could park. I was very happy that I was able to drive to the venue. Back in July when I had been invited to present, I did not have a driver’s license. I would spend the entire summer in driver’s classes and after trying to pass my Maryland’s driving test three times; I finally succeeded on the 4th try in September. Needless to say, I am not very good at driving. My family was a little worried that I was going to drive across Pennsylvania and into New Jersey as a relatively new driver. After I hit my first New Jersey pothole going 55 miles an hour, I was pretty worried too. I arrived in New Jersey on the evening of the 18th and stayed with the family of John Phelan as they were willing to play host. John is a member of The Walking Gallery.He is also the founder and CEO of Zweena. I really enjoyed talking with him about Health Information Technology while I was visiting. I am thankful to his family for tolerating our mutual interest in all things data. On the 19th I parked my car and rolled my suitcase full of art supplies to the student union. I set up my easel and began to paint. Since I knew little about this venue I began a Gallery jacket. Like many venues I have attended, the custodial staff was the first to approach me and ask questions. Next the curious students walked up to me and began to speak. I was so happy the students were asking questions. All too soon, I needed to put away my easel and walk to class to begin my lecture. “First, let me briefly introduce myself. I am an assistant professor at The College of New Jersey (in Ewing, NJ, between Trenton and Princeton). I got to "know" you through two NPR articles and then your blog. I wanted to contact you for two reasons. First, as an individual, I am so with you and your work! Second, as a professor who teaches an advanced undergraduate course titled "New Media and Health Communication," I can't help but inviting you, or attempting to invite you to give a speech (or a virtual speech via Skype etc) to my class, because some topics we survey in the class are so relevant to what you have done and are doing, e.g., patient doing online health search or bringing online health information to the doctor, EMR. I teach this course once a year in the spring semester; if you are interested in the idea, I will contact you again when we approach the end of this year. 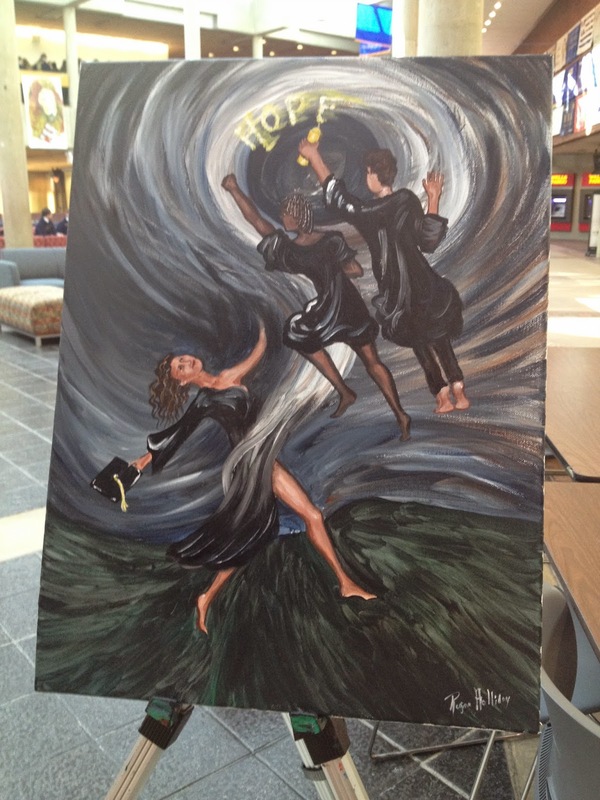 I painted this in the student union. It began with a maelstrom of clouds. Students came up to me throughout the day and asked about the significance of the painting. I explained the spiral of energy leading to a question as an image of their college experience. After awhile I spoke to a young man who was trying to raise funds for an art installation. I told him about the power of crowdfunding. He is the man spraying the word “Hope.” The African American woman in the painting was a student who happened by and was happy to see me painting. All the figures seem endowed with great energy. On February 20th I gave a large lecture before various departments. In this speech I was my usual emotive self and the audience responded accordingly. I was also a bit loud. At one point a fellow came from the outside café in the hope of hushing me. That is rather hard to do as many people have realized over the years. I wrapped up my speech and thanked everyone especially Yifeng. She had been such a gracious host. Do you know she plays the violin? She is quite accomplished at it. I hope someday to introduce her the Tom Delbanco, MD who works on the Open Notes project. As he also plays and appreciates the power of the whole note just as Yifeng appreciates to hope her students have in the future to come. I love your work Regina. I work in a hospital in Melbourne Australia; and I'm a regular patient with a long term illness. All hospitals need to see the world through patient eyes. Hopefully one day your work will bring you to the sunny shores of Australia to speak! I hope you will keep wriring.